Web designers are, first and foremost, artists. It’s probably not very common for a designer to also be good at code. So, what happens when a client has budget for a web designer, but not for a programmer? Enter Adobe Muse, a product intended for designers who want to easily and intuitively put together beautiful websites, without having to touch a line of code. Research online has uncovered that this product may be great for designers who already are familiar with Adobe products, but it has a steep learning curve for those who are not. Adobe Muse contains none of the pre-designed templates that other instant web design software may have. However, if you are a designer who has experience, you may find this tool invaluable. If you’d like to try it out, Adobe offers a free trial of this product, along with their other products here: https://creative.adobe.com/apps?trial=MUSE&promoid=JZXSX. 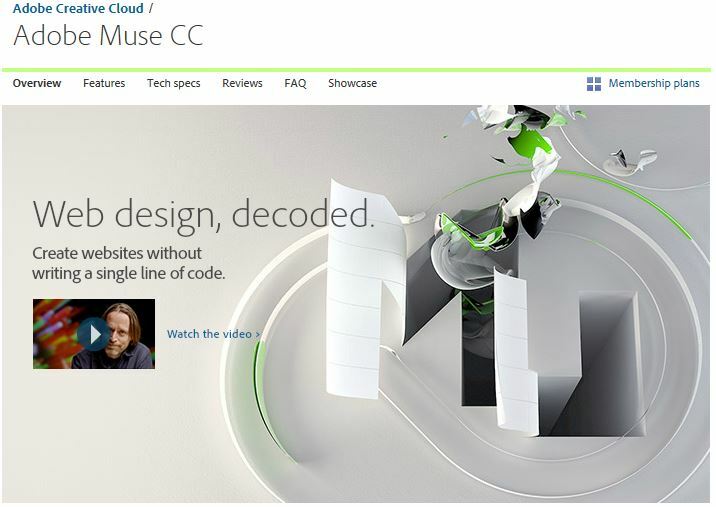 We found examples of web design created with Muse on Adobe’s site. Take a look! Allovus wants to know; have you created a website using Adobe Muse? If so, we’d like to hear your thoughts on the product. Tags: Adobe, Adobe Muse, creativity, designers, web design. Bookmark the permalink. the main problem i have with editors like this is that you actually become more of a slave to the technology – instead of the other way around. being an artist who can also code, i’ve found that there’s no substitute for being able to handle the project from concept to code. wysiwyg editors seem to kill that ability. but – just my 2 cents. thanks for the article, though!